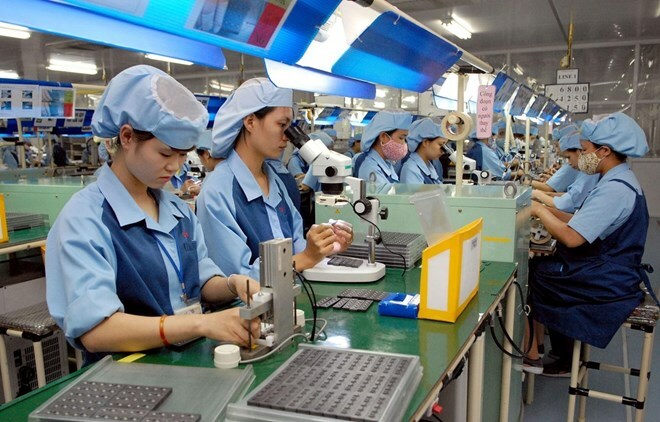 Hanoi (VNA) – The number of newly-established businesses in the first quarter of this year reached 28,451 with the total registered capital of 375.5 trillion VND (16.14 billion USD), up 6.2 percent and 34.8 percent year-on-year, respectively. According to the General Statistics Office (GSO), the average capital for each new firm was 13.2 billion VND. In March alone, 12,472 new companies were set up, with a combined registered capital of 128 trillion VND, a surge of 111 percent in quantity and 33 percent in capital compared to the previous month. Each company registered an average of 10.3 billion VND in capital. Together with the 722 trillion VND of additional capital injected into companies already in operation, total capital poured into the economy in the first quarter of this year was 1,098 trillion VND, reported the GSO. GSO Director Nguyen Bich Lam said that the impressive growth of business numbers in the first quarter show the efficiency of support activities for companies. Businesses’ confidence also rose as 54.6 percent of those in the processing-manufacturing industry expected better operations in the second quarter, said Lam. The total number of labourers employed by new firms was 317,000, up 40 percent year-on-year. During the period, the majority of new companies operated in the areas of retail, wholesale, automobile and motorbike repair, construction, and manufacturing-processing. However, a number of sectors saw drops in the number of new businesses, including accommodation and restaurant services (7.7 percent), financial-banking and insurance (14.2 percent), and mining (8.6 percent). The Central Highlands region recorded the highest rise in business numbers at 15 percent, followed by the Red River Delta at 14.6 percent, the North central coast at 8.7 percent, the Southeast at 3.2 percent, and the Mekong River Delta at 3 percent. On the contrary, the northern midland and mountainous region suffered a fall of 6.3 percent in the number of new firms. The GSO reported that in the first quarter, 15,050 companies resumed operations, a surge of 78 percent over the same period last year, raising the total number of operating firms to more than 43,000. The GSO said that in the first quarter, 14,761 businesses temporary halted their operations, up 20.8 percent year-on-year, while 15,331 firms registered to dissolve, and 4,116 others completed dissolving procedures.